1. High stability can be ensured by using software to auto calibrate. 2. The frequency can be as stable as that of the crystal oscillator, the resolution high by using Direct Digital Synthesis (DDS) techniques. 3. Digital linear sweeps, logarithmic sweepsand adjustable amplitude. 4. 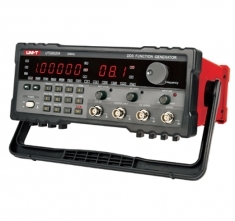 The instrument sweeps can be completed within the full frequency range while analog signal generator sweeps are performed segmentally. 5. A large number of integrated circuits are used to fully integrate and enhance reliability. 6. Enter frequency parameters with the keypad or turn the rotary knob continuously to adjust them. The panel is clearand easy to use.